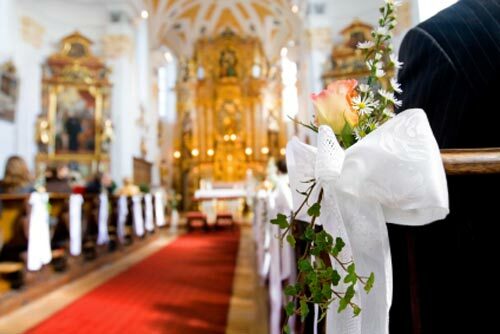 Before decorating the church for a wedding, the first thing to do regarding church wedding decorations is to ask your priest or vicar if there are any restrictions with the church wedding decor. Some churches have their own policies and customs regarding the place of worship, so it's important to ask before going to the effort and expense of purchasing flowers, church pew decorations and other creative ideas you may have only to find they are not permitted. I found most churches will allow a medium size floral centerpiece near the alter or a centerpiece on either side. Pew decorations, candles and wedding aisle runners are common. Some allow you to decorate the outside entry of the church. Here are some examples of church wedding ceremony decorations, tips and ideas to get you in the decorating mood. A grand and beautiful church like this, does not need much in the form of wedding ceremony decor. However, pew decoratons do add to the finishing touch. 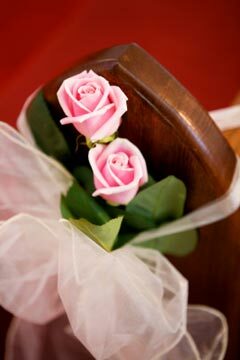 Two long stem pink roses tied and secured with organza ribbon. A simple and perfect wedding ceremony pew decoration. Wedding candle centerpieces are one of my favourites. 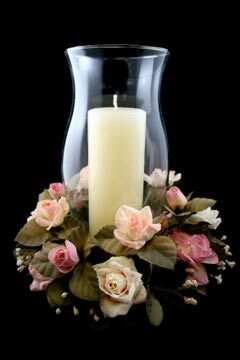 When the candle is lite it brings a romantic ambience to any setting. 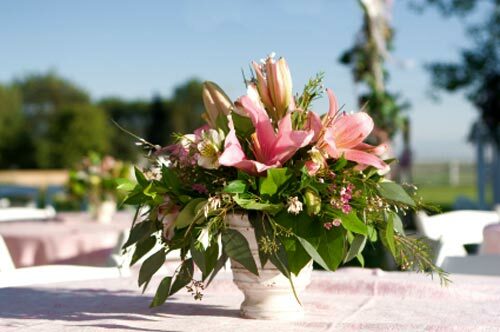 Wedding floral centerpieces arranged in a white clay or ceramic vase add elegance and sophistication to your special day. When the wedding ceremony is over, get one of your wedding planning helpers to deliver it to the wedding reception. Scattered flower petals in the church add that romantic touch, if you are heading in this direction, get permission from the church first. Rice or confetti are least favoured because of the mess they cause, not to mention what they do to the bride's hair do. The fairy princess bride walks on petals before she says, "I do". 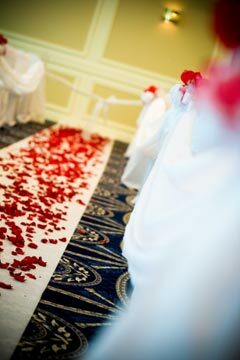 Scattered rose petals have been used in weddings from the beginning of time. On a tight wedding budget? If the budget is tight, it may be worthwhile asking the priest if the church has any pew decorations (from previous weddings). Most priests and ministers are happy to help. Wide acetate floristry ribbon holds its shape quite well, if you are creative you could make these yourself. Clever low budget wedding aisle decorations. Elegant church wedding decorations come in varied forms. Wedding church pew decorations are by far the most popular wedding ceremony decor. You can start off with decorating the first pew, then every second pew, until you have 6 decorations on either side. If you are not on a tight budget, you could decorate every pew along the aisle. This idea of decorated hand rails creates a lovely first impression of your ceremony. Sophisticated church wedding aisle decorations for the celebrity princess bride in all of us. 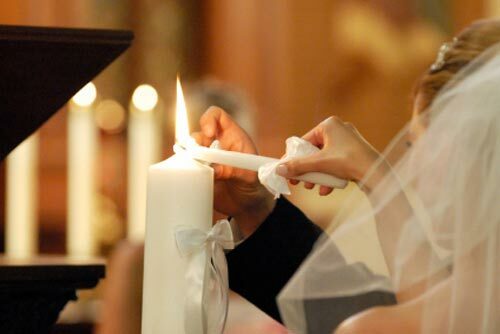 Candles are commonly used in churches, the practice of the bride and groom lighting a unity candle at their wedding ceremony is a tradition that has been carried through for years. Becoming more and more popular. 1. 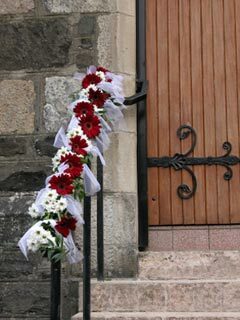 Pew flowers can be made with pew clips or wedding pew markers. 2. Pew flowers can also be tied back with ribbons. 3. A simple decoration of wide acetate floristry ribbon made into a decorative bow, no flowers neccessary. 4. A pomander of kissing flower ball hanging from the pew, doubles up as reception table decorations. 5. 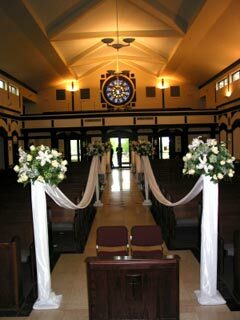 Drapped tulle fabric along the pews, with or with flowers. 6. 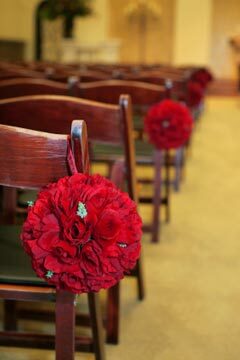 Scattered rose petals along the left and right of the aisle. 7. Flower girl sprinkling flower petals as she walks down the aisle before the bride. 8. Wedding candle centerpieces on either side of the alter. 9. Wedding floral centerpieces arranged in a ceramic vase on the alter. Are wedding ceremony decorations necessary? Church wedding decorations are an option. Most Churches are already decorated with stained glass, lovely flowers and candles. My advice is to visit your church first and see what they have, then start thinking of wedding decorating ideas if you think you'll need them. I only needed to organise pew dorations for my church wedding, everything else was just perfect.